More of a ‘programmy’ topic today – this one about storing hierarchical data (data that could represent a tree) as records in a relational database. The method I used in a personal project of mine, however, is different to all of these. Today I found this Evolt article, which pretty much describes the technique I’m using, calling it ancestor tables. I don’t know if it’s just because I don’t know the right name for it, or if people just generally haven’t thought of it, but finding anybody using this method has been pretty difficult – for whatever reason, nested sets (which I believe has serious flaws) and materialised paths seem to be all the rage instead. First, I’ll describe each of the alternative methods in brief. More information is available in this article from DBAzine, though you can find an easier to understand description of nested sets in this one from MySQL. An adjacency list just means that for each node, you also store the ID of its parent node. It’s easy to write a query to find immediate parents or children of an node using this method, but finding a list of ascendents of descendents, including non-immediate ones, requires some sort of fancy recursion. That’s a well acknowledged limitation of this method, and if you look around the web you’ll find a lot of people pointing this out, at the same time singing the praises of nested sets as if they’re the only alternative. A materialised path means that for each node, you store a string which represents the path to that node. For instance, the node with id 13 might have a path of ‘1.2.12’, meaning that it is the immediate child of 12, which is the child of 2, which is the child of 1. This opens up a few more possibilities in terms of efficient queries that can be made. For example, you can easily find all descendents of an node using a WHERE path LIKE ‘1.2.%’ type of syntax, or just WHERE path=’1.2′ if you only want immediate children. Efficiently finding ancestors is still a bit fiddly, as is moving an node to elsewhere in the table, but it’s not unmanageable. I actually think it’s a good solution. Nested sets are more complicated than any other method. For each node, you store two integers, which represent a ‘range’. 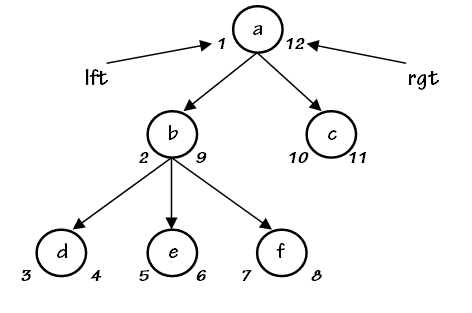 The ‘root’ node of the tree contains the lowest and highest numbers of the whole tree, and each branch contains the lowest and highest number of that branch. It’s probably easiest to illustrate this with a diagram (which I found in this article). Each number between the lowest and highest is used once and only once in the whole tree. The major benefit to this is that it makes finding all descendents of a node fairly efficient. To find children of an node, just find all nodes WHERE leftvalue > parent.leftvalue AND rightvalue < parent.rightvalue. It’s highly inefficient, however, when you only want immediate children, ie only a single level of descendents. It also lets you down substancially when making any modification to any node in the tree; any creation, deletion or moving of an node will always require, on average, half of the rows in the whole table to be updated. Good if the tree is very small or you never plan to update it; bad otherwise. Variations of nested sets exist which attempt to solve some of its problems, but these tend come at the cost of even greater complexity. I was reading about a method with ever decreasing fractions for increasing levels of the tree earlier. The total number of rows needed in this ancestor table is related to the number of ancestor-descendent relationships in the whole tree. If your average node is nested only 4 levels away from the root node, then you only need about 4 times the number of nodes. It’s much less even than O(n log n). The method allows for all of the following queries to be efficient, requiring no recursive joins or multiple queries. As you can see, none of these queries need recursive joins, or require the database to inspect more rows than they need to, and none of them even require looking up certain information (such as the path to the requested node, or left and right values) before actually doing the query that returns the rows. Add a LEFT OUTER JOIN to your main node table, and you can fetch all the necessary data about each node (name, properties, etc) in the one query. You can even do efficient sorting via the same index used to fetch the rows, as long as you add columns to the ancestor tables for whatever data you want to sort on and use indexes wisely. It also means that when inserting a new node, or making another edit to the tree, you do not have to modify the majority of the tree – only the entries in the ancestor tables that belong to that node. This is similar to the materialised paths technique, where you only need to update the path for the node you change. The following article was originally written in July 2005 and published on SitePoint.com, and is republished with permission. For securing your web application you should probably also read about CSRF and clickjacking. Cross-site scripting (XSS) is a form of security exploit that threatens any web application. In the past, its severity has tended to be underestimated. The problems go far beyond annoyances and practical jokes perpetuated by script kiddies. By stealing your cookies, Cross-site scripting attacks can allow attackers to gain administrative access to your web application. This code may either be relatively harmless – for example, creating unwanted popups or spam – or malicious – code that is intended to gain private information in order to break into each user’s account on the system. Code intended to disrupt the layout or appearance of a web page. Scripts, applets or objects intended as a practical joke, displaying annoying messages or popups. Code intended to launch unwanted popup windows for advertising or shock value. Objects or applets intended to exploit a known security vulnerability in a particular browser. I find that cross-site scripting can be a difficult concept to picture. Iâ€™ll lead you through a typical cross-site scripting scenario, to gives some examples of what is possible. Joe has built himself a custom CMS complete with user accounts, sessions and different access levels for different users. To log into his CMS, he enters a username and password into a login form on the site. For the duration of his browser session, a cookie stores his â€™session IDâ€™ which allows him to remain logged-in while navigating around the site. Joeâ€™s website also allows any user to sign up for a new account, and place a â€˜messageâ€™ onto the Website. For example, a message can be placed in a blog comment, or in the userâ€™s profile, or even the userâ€™s username. Unfortunately, Joe forgot to use htmlspecialchars or an equivalent to escape plain text in HTML in some places where he echoes user-submitted content to the browser. Now, whenever Joe (or anybody else) views the guestbook, he will be redirected to a page on Rickâ€™s site. Whatâ€™s more, the cookie from Joeâ€™s browser session has been transmitted to Rickâ€™s web server as part of the URL. Rick now uses the cookie from Joeâ€™s browser session to browse Joeâ€™s CMS using Joeâ€™s account. Rick may even be able to change Joeâ€™s password, give himself administrator access, or start deleting content. Rick gained administrator access to Joeâ€™s CMS by placing a <script> tag into Joeâ€™s guestbook. What we are dealing with here is session hijacking – stealing the session ID (which is often stored in a cookie) from another user in order to impersonate them on the system. XSS is a way for an attacker to obtain access to sessions on another server. If Joe clicked that link, as he may do without even thinking, his session ID would be transmitted to Rickâ€™s server. Below are some steps which you can take to help prevent cross-site-scripting attacks from being used on your PHP application, and to limit the amount of damage that can be done in the event that someone finds a way anyhow. Whenever displaying plain text content on your web site, escape the plain text string before doing so. In PHP, a simple way to do this is to use the htmlspecialchars function on the data right before. This includes all plain text data, whether it be user-submitted or not. The idea is that < and & characters need to be escaped whether their use is malicious or not. You may be displaying unfiltered user-submitted content where you donâ€™t realise it. For example, the following is dangerous. You can also reduce the amount of damage that could be done if a user does hijack a user session. When designing your CMS, do not rely entirely on cookies for user authentication. Cookies are an excellent convenience feature for users, so their use is encourage, but there are some highly important tasks that may call for more protection. In addition to the cookie, users should also be asked for their password when they undertake activities such as changing their (or anybody else’s) password or escalating their privilege level. So, if your session is hijacked using your session ID, the attacker wonâ€™t be able to lock the rightful account owner out of the account or retain control over the account after they leave. Reducing the risk in the case of an attack, however, should be a secondary priority to preventing an attack in the first place. What if you want your users to be allowed to submit HTML? Escaping plain text for output is easy. All that needs to be done is to replace a small set of special characters with their escaped equivalents in HTML. However, if a web application allows users to submit actual HTML (say, from a rich text editing control, or even prompting the user to type HTML in manually), then filtering this for safe output on a web page becomes much harder. Filtering HTML cannot be reliably done with a search and replace statement or two, or even a highly complex regular expression. Any filter would need to be able to interpret the HTML in the same way that a browser – any browser – might, and browsers do some strange things. A common compromise, as seen on many blogs, is to allow only a small subset of HTML. This makes filtering considerably more attainable than otherwise, but by no means simple. A read through of the XSS cheat sheet will reveal the necessary complexity of any required filtering mechanism. What’s more, new methods of defeating XSS filters are discovered all the time (and may be added to the XSS cheat sheet at a later date). I myself have written a rather comprehensive HTML and XHTML filter in PHP, and it consists of 3 files of source code with over 2000 lines of code in total, not including DTDs. It is capable of understanding the entire HTML language in terms of its DTD. To say it is complicated is an understatement, and it still has its limitations. If you wanted to go down that path you could use HTML Tidy, I presume, incorporated with your own filtering code to make the filtering part a bit easier. A way to test for Cross Site Scripting vulnerabilities is to insert testing code into every field, and every variable passed on the query string, that you can find in your application. The XSS cheat sheet that I mentioned above is the best source of XSS testing code that I know of. Try, for example, inserting the following code where you would like to test. Cross Site Scripting can even be a problem in situations where HTML is filtered out of user-submitted content but another markup language is used. Is your forum or wiki vulnerable? More information about cross-site scripting is available in this CERT Advisory and this document from Apache. The Apache document points out, rightly, that the name “Cross-site scripting” is a misleading term, since the attacks need not involve scripting, and they need not even be across sites. Previously at SitePoint, Harry talked about Handling Content From Strangers, which gives some more information on how you can protect your application from exploits. Have a look at this very thorough article by Chris Shiflett on preventing cross-site scripting attacks. Cross-site scripting is only one possible form of remote attack on a web application. It is probably one of the most common vulnerabilities in web applications. However, other common vulnerabilities such as CSRF, including Login CSRF (PDF), and clickjacking, are just as serious.